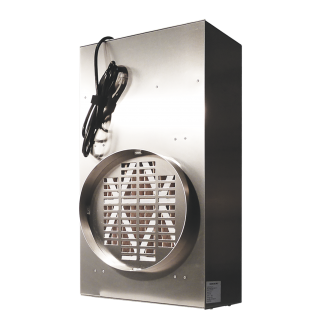 The PEROx PG-3 air purifier is a powerful tool at fire and flood restoration projects, mold abatement, and for control of VOC’s, odor and bio-contaminants. This portable unit with dual generators can safely operate in occupied areas and control odors from restoration projects as well as provide high output sterilization during the final cleanup process. 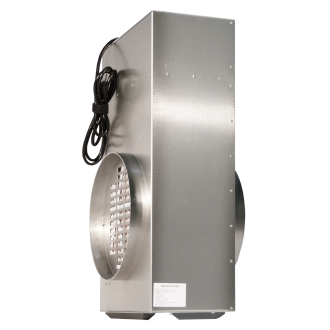 The highly portable PEROx PG-3 is designed to be connected by flex duct to the exhaust from OmniAire machines or to the intake side of any air mover with up to 2000 CFM output. The PEROx purification process utilizes hydro-peroxides, an ionized oxidizer plasma, which rapidly sanitizes the air passing through the unit and continues to seek bio-contaminants in surrounding air and on hard surfaces. The PEROx PG- 3 purification process utilizes hydro-peroxides, an oxidizer plasma, which rapidly sanitizes the air passing through and continues to seek bio-contaminants in surrounding air and on hard surfaces. Our process creates positively charged particles which both repel each other forcing distribution, and attract to surfaces making sanitizing hard to reach spaces more efficient. The created ionized hydrogen peroxide disperses like a gas and attaches to all surfaces in the containment area destroying bio-contaminants immediately. Since these positively charged droplets are attracted to all surfaces PEROx technology is ideal for attacking odors at the source. Because ionized hydro-peroxides are not affected by temperature or humidity, PEROx PG-3 air purifiers can be used in a wide range of applications and environments. When the job is complete, unused oxides convert back to H²0 and O² within 15 minutes with no chemical residue or additional decontamination. This makes the PEROx one of the most environmentally friendly air purifier methods on the market. Our purification process constantly occurs in nature and has been used in thousands of HVAC installations with no known health risks. PEROx air purifiers provide a multitude of benefits in a wide range of industries. PEROx PG-3 machines are designed to be used effectively at abatement and remediation sites for odor, VOC, and mold control as well as sterilization after final clean-up. Our air purifiers may also be found in bio-contamination sites such as crime scenes, medical facilities, and lab environments to control virus and other dangerous bio-hazards. Cabinet: Aircraft grade aluminum, closed end rivet construction. 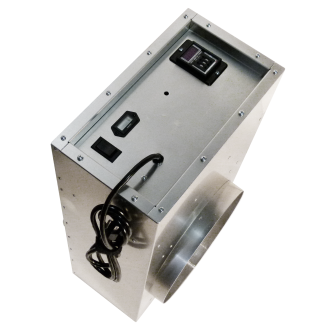 Power Requirements, Air Purifier, Note: 115-230 VAC/50-60 Hz/0.4-0.2 Amp, (2) IO generators, The technology used in Hydro-Peroxide purifier is successfully and safely used in thousands of installations in HVAC systems. There is no known case of hydro-peroxides ever creating a health risk.